The German invasion of the Soviet Union began on June 22, 1941. Over the next four years--from the initial invasion and sweep of the German army through the western Soviet Union, through the siege of Leningrad and the battle for Stalingrad--between 1.6 million and 2 million Soviet citizens perished. A citizen's daily ration at the height of the siege was a square of bread the size of two fingers. 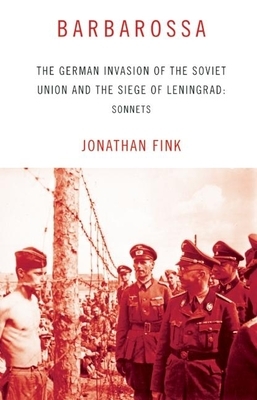 In Barbarossa, award-winning poet Jonathan Fink presents a collection of sonnets focusing on the individual lives of Leningrad citizens during the first year of the siege, from the initial German invasion of the Soviet Union to the formation of supply routes over the frozen Lake Ladoga. With precise language and breathless power, Fink illuminates the tension, complexity, and singularity of one of most colossal operations of World War II and the lives it transformed. Jonathan Fink is an Associate Professor and the Director of Creative Writing at the University of West Florida. His poems and essays have appeared in "Poetry," "New England Review," "TriQuarterly," "Slate," "Witness," "The Southern Review," and "Virginia Quarterly Review," among other publications. He has received the Editors Prize in Poetry from "The Missouri Review," the McGinnis-Ritchie Award for Nonfiction/Essay from "Southwest Review," and fellowships from the National Endowment for the Arts, the Florida Division of Cultural Affairs, and Emory University, among other institutions. His first book, "The Crossing, " was also recently published by Dzanc Books. He lives in Pensacola, FL."